If you’re originally from “back east” or from the Midwest, you are in good company. So many people have relocated their homes and families to the sunnier side of the United States that it seems an actual Phoenix native is getting harder and harder to find. But no matter how long you’ve lived in Phoenix, every once in awhile something evokes childhood memories of “back east” and that place in Phoenix, just might be the Roosevelt Historic District. Homes have wide shady porches to read a book on during summer break, attics “like grandma’s” to explore, and dining rooms with pocket doors that can be so useful when playing hide and seek. Bungalows are the norm in the Roosevelt Historic District and “fixer uppers” are few and far between. These Bungalows don’t have “an average size” that means anything since they were never cookie-cutter homes, but they range from 1800 to more than 3000 square feet, usually with at least 4 bedrooms and multiple baths. Historically a residential neighborhood, today some of the largest homes—especially along Roosevelt Street and 3rd Avenue—serve as offices for lawyers and other professionals because of their proximity to government offices a few blocks to the south. And that’s only fitting since doctors, lawyers and businessmen were the original residents in Roosevelt. If these large homes seem overwhelming, look closer to Central Avenue where you will find townhomes, condos, and apartments. 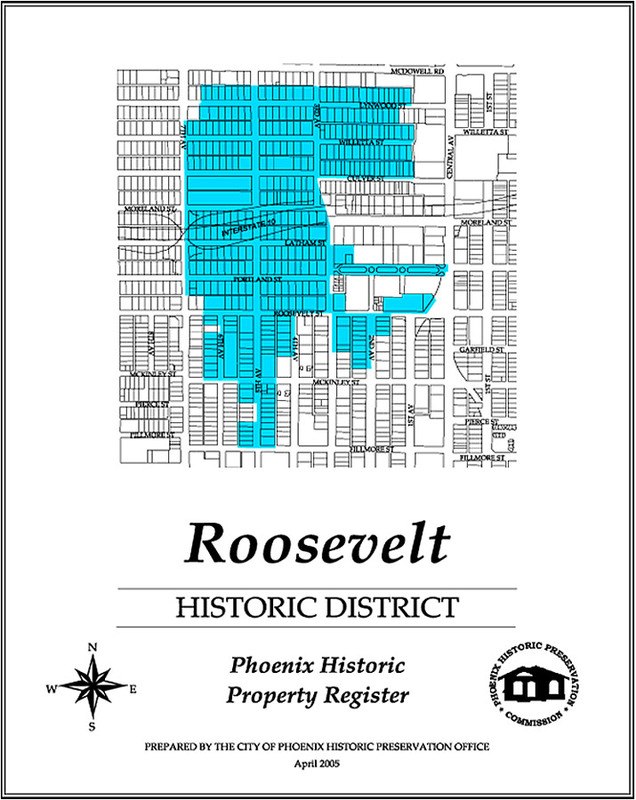 Roosevelt Historic District is probably the ultimate “downtown neighborhood” in Phoenix, an urban neighborhood with choices. Walk to the Public Market or Famers’ Market, to many popular restaurants, to work if you work in any of the corporations that call downtown Phoenix home. Walk to the Comerica Theatre or Puppet Theatre (it’s not just for kids anymore) or catch the light rail and go to a ballgame at Chase Field. If the kids need a book to read over summer break, the Burton Barr Library is right there on Central. If the dog needs a change of scene, walk her to the linear Margaret Hance Deck Park that covers much of the I-10 traffic travelling through a tunnel below. Should you feel the need to use a car, be forewarned that the streets in Roosevelt were designed in horse-and-buggy days. If you park along one of Roosevelt’s residential streets, don’t try to open the curb-facing car door or you’ll get a nice scrape as a reminder of the ultra-high curbs here! If you like the homes in Roosevelt, you may also like the F.Q. Story and Alvarado historic districts. Roosevelt Action Association is a strong group of neighbors who have been advocating for their urban neighborhood for decades, helping to make Roosevelt the first recognized historic district in Phoenix and one of the most desirable neighborhoods to call home. Roosevelt Row is usually planning something fun at the galleries and businesses that line Roosevelt Street. In addition to the historic overlay, Roosevelt has a Special Planning District designation that helps to protect the history of this neighborhood.